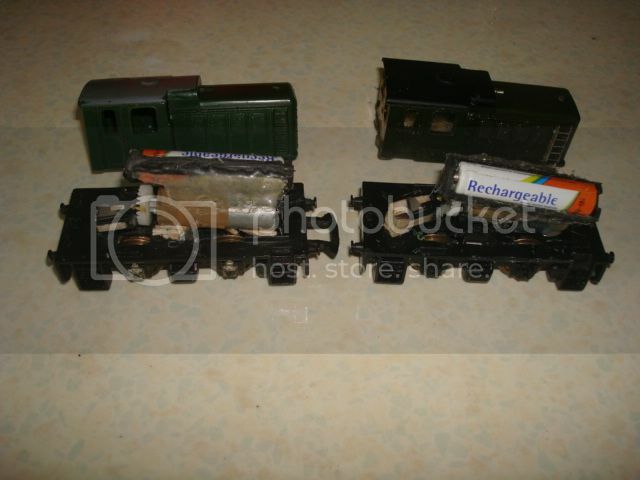 Two very cheap recently acquired Jouef Diesel shunters. The basic problem with these has has always been that they only had drive to a single axle. I thought it might be time to see about trying to re-work that. 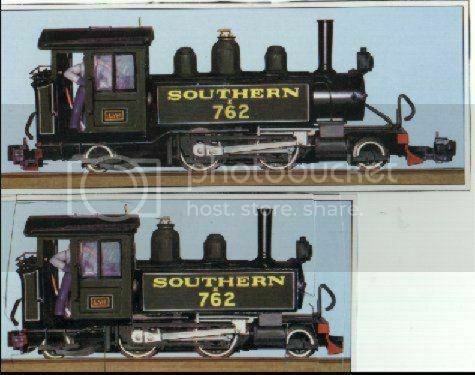 The idea with getting two was that of using both the geared axles on one loco and giving the remaining body a chassis from elsewhere. I've never seen one of these with two axle drive, but there is most decidedly a lay shaft mounting already in place, and it turns out to be a pretty simple job to fit two sets of crown and pinion gears to couple up the second axle. I won't need that extra chassis. They don't have much internal volume, but it is all free and conveniently arranged. 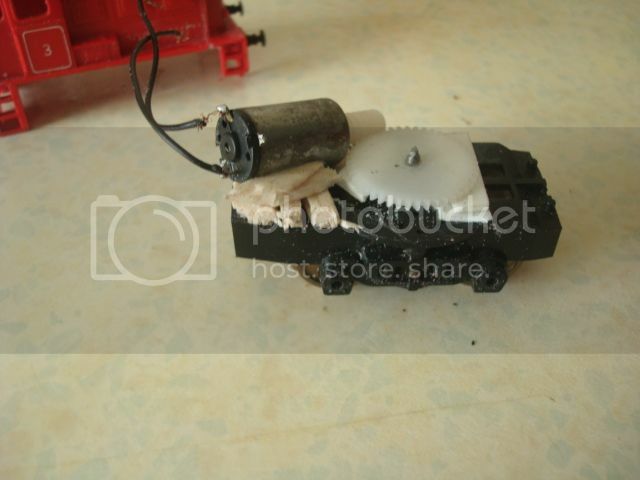 Fitting motors for the Jouef Playcraft shunters has gone well. Plenty of room for the control chips in the cab space, and I may be able to keep it below window level. So far so good. 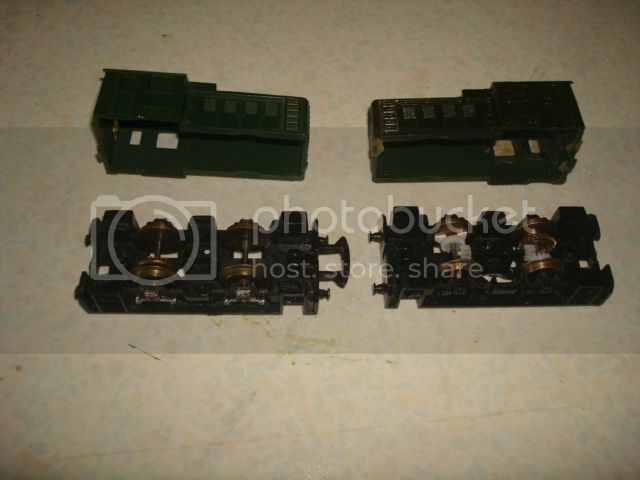 I'm holding off the soldering small wires stage on several locos until I am a bit less tired. 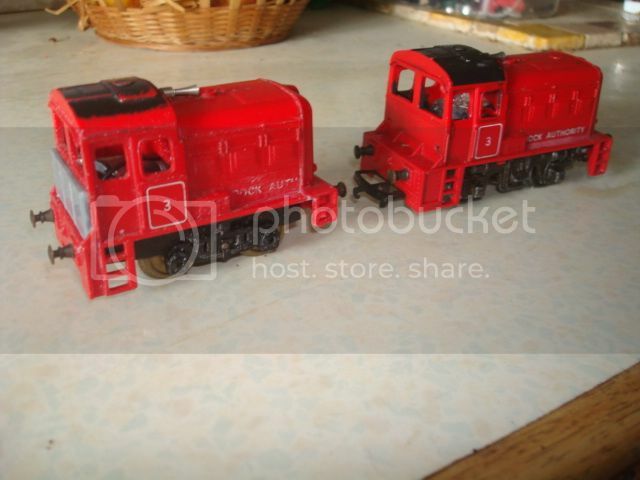 From a Jouef Class 29 I have taken the bogies to use separately, the both have 4-wheel drive. Here getting the gearing and motor mount came first, before I started thinking about what body might fit over the top. It's coming out remarkably compact and tidy. Now, what to turn it into, It really was compact, so I'm going for a reduced dock shunter. This has lost one bay of doors/vents. from four to three, and some trimming and modification at the rear. Some work below the footplate level remains, and I'm going to move the horn forward and fit a slightly more prominent exhaust in its place. I thought of naming it "Baby" but that might just turn into "Duvalier" going a step further. 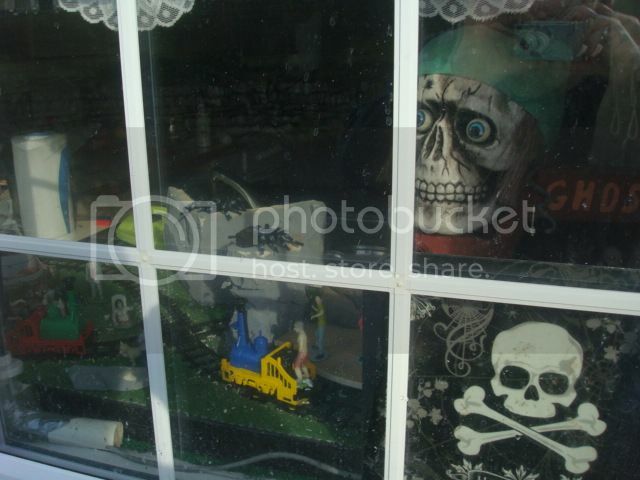 An almost instant out of the scrap-box and into the window was a Halloween display. 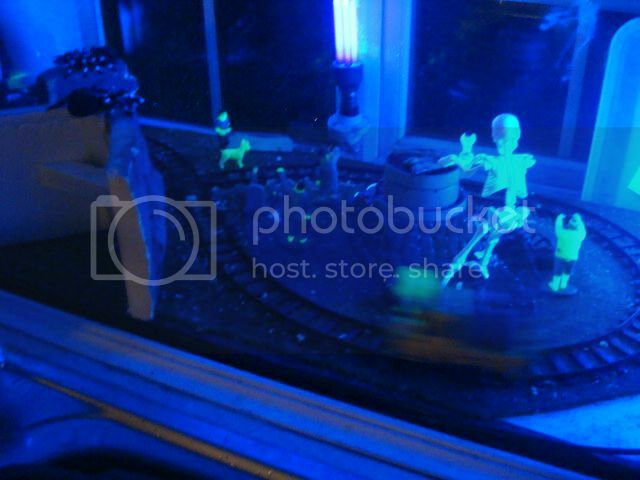 Faller mini playtrain locos and track intended for a Sylvanian families display layout got glow in the dark zombies from my garden railway, and a chunk of scenery with a life-size zombie pirate's head from a layout four years ago. It looked and worked better than I had feared. AWNUTS I was. I made the cover twice. And got my photo in a Dutch newspaper for "exhibiting". Mad Professor I have always been. ...Well it's the madness that keeps me sane. 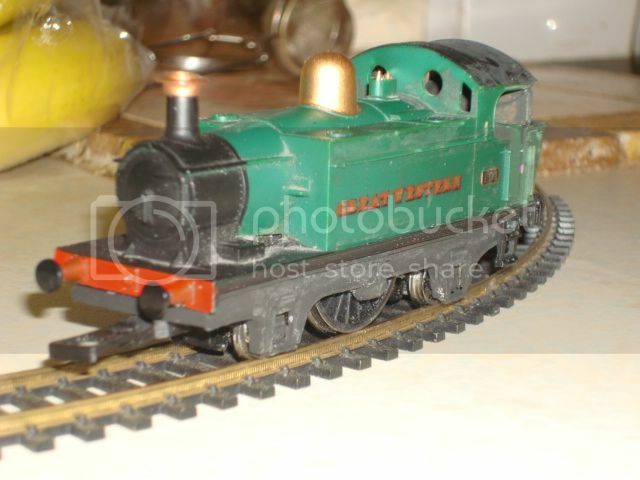 I once thought the Bachmann Lyn looked too long, especially compared to my other little G scale locos. What I did to the the box illustration looked OK to me so, yes, I did it to the loco too. It was much better-behaved on tight curves after that. 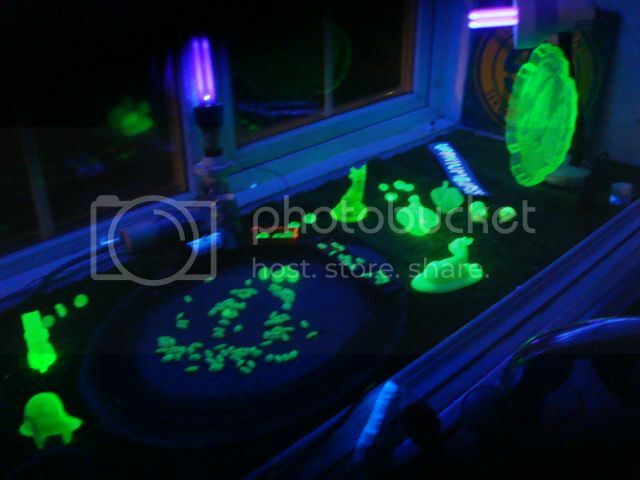 Most of my uranium glass collection with a bit of it being pulled round a very tight oval (about 6" radius at the sharp ends) by a Hornby 0-4-0 with some UV glow paint added. The performance of the long car transporter wagon is impressive and ludicrous. There is an outside push-button switch to make the train go, in addition to an on-off one inside. My work capacity is getting lower. I may have to do something ultra quick and dirty and then call it a day for a while. Interesting - is it something you have been interested in for a long time - uranium glass? I really love the motor mount in the red diesel, third photo from the top! You're nuts in a very good way! rosenblad wrote: I really love the motor mount in the red diesel, third photo from the top! You're nuts in a very good way! Those Playcraft bogies are turning out to be very handy. The odd angle of the motor is A) because it is the most compact in plan view and B) just out of the plane of the gear wheel (about 15 degrees, but by eye) so the teeth of the worm gear come in at 90 to the large gear, it not having bevelled teeth. I do like the glued balsa mounts because if the mesh isn't spot-on you just split (or even half-split) the balsa along the grain and make a tiny adjustment. That red diesel chassis has, I think, come out a bit too fast, but I'm nearly ready with a matching bogie with double the reduction and I will compare the two before going Dr Frankenstein on the first one. Yes I am mad. I admit it. 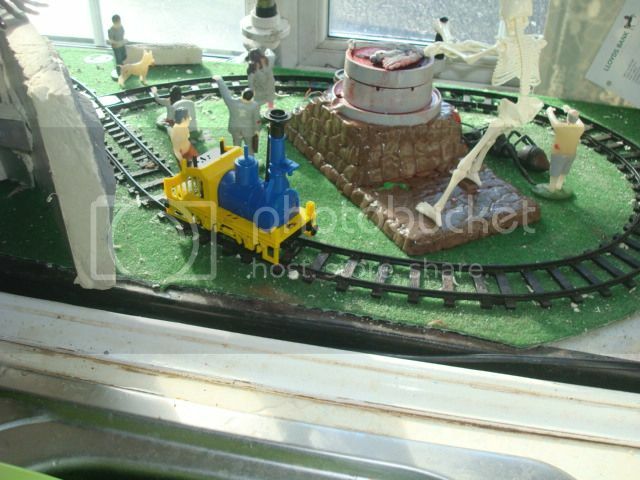 My last exhibition layout was a portable G scale layout where the public drove the locos and operated the points. Just a quickie testing of an idea. Though it works well enough that I may only build a neat and tidy version if it has to appear in public. The plastic "coke can" is big enough to shuffle them well, and the tube (with a little internal funnel to prevent jamming) instantly selects and displays five out of eight. Round marbles in eight colours I could not locate cheaply, and I'm not sure if round beads would serve well enough. They would allow something more compact. If in practice it bothers me I will paint out the dots. you could always use the dots to add another layer of complexity, over here in the states I think your idea would go down great as there are lots of people doing shunting puzzles and working to a timetable, and they use various card/dice and other random versions to give random train consists and destination routes, that looks well thought out, compact, and with a bit of thought would be very presentable, perhaps use a "bottled water" bottle instead of a coke can, as it has a natural funnel to feed the five of the eight die into the tube, I am sure some here could give lots of ways to use the numbers on the dice, everything on a railway is controlled by numbers. 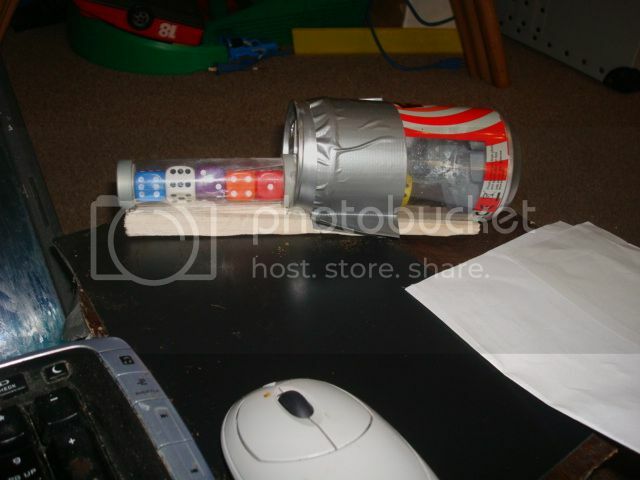 brit-in-bama wrote: ... perhaps use a "bottled water" bottle instead of a coke can, as it has a natural funnel to feed the five of the eight die into the tube, I am sure some here could give lots of ways to use the numbers on the dice, everything on a railway is controlled by numbers. The water bottle idea is excellent. I will check on that. For the numbers (or other markings) on the dice to make a difference I think a square extension tube would be required, to force a definite orientation of the dice. That's no problem. Emettman wrote: For the numbers (or other markings) on the dice to make a difference I think a square extension tube would be required, to force a definite orientation of the dice. That's no problem. Or just mask off the "back" of the tube. My brain is mulling ideas in this area. It may have had a good one, but experimentation will decide. 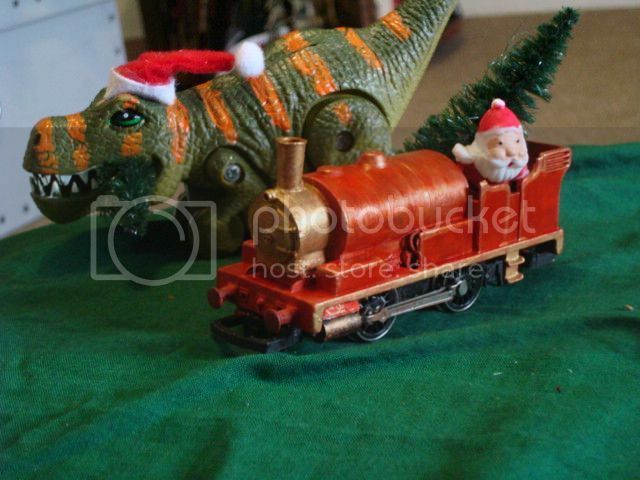 Meanwhile the loco for the next bit of the Christmas window display has appeared. Back to something only slightly more sensible for my latest outing to battery power radio control. The Bachmann chassis I have had around for twelve years or more, and it has finally got the conversion I always intended, though not in the scale I originally had in mind. And if there was a prototype anywhere near this I will be shocked. But I likes it, and it is happy there in the photo on a 10" radius curve. There's room for a fair bit of weight, so it should be useful for inglenook shunting.